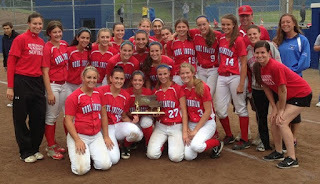 The BHS Softball team held off a late Tewksbury rally for a 6-5 win yesterday and the title of Division II North Champions! BHS will play Bishop Stang Wednesday at 6:00 at Martin Field in Lowell. The winner of the game will play in the state championship game in Worcester on Saturday. For a detailed recap and more picture from the game you can see see the Burlington Patch.